Posted on July 29, 2012. 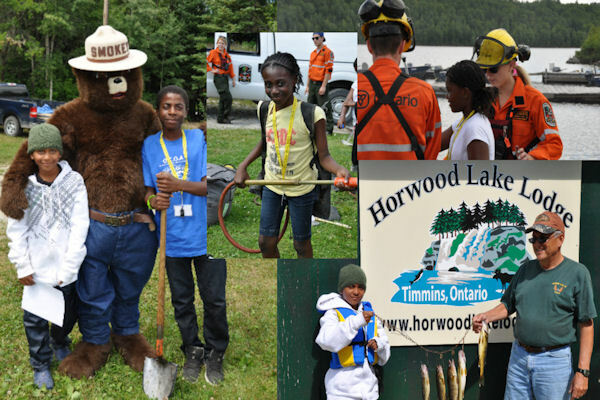 From July 16th to 20th, 2012, Horwood Lake Lodge hosted the annual Kids and Wardens Fishing Adventure. This marks the sixth straight year the Ontario Conservation Officers Association (OCOA) has worked with the lodge to provide a trip of a lifetime to members of a Boys and Girls Club from a large urban centre in Southern Ontario. Joe and Sharon Richter, owners of Horwood Lake Lodge near Timmins (www.horwoodlakelodge.com), opened up the lodge for the week and provided the cabins, boats and motors free of charge to the visiting group. “I learned how to fish” and “I had so much fun I wanted to stay forever” are just a few of the many comments made by the children attending the camp. This year the club chosen to attend the fishing trip was the Jane and Finch Boys and Girls Club from Toronto. Nineteen kids and four counsellors boarded the bus in Toronto for the long drive up to Horwood Lake Lodge located approximately 100 km west of Timmins. Along the route they were joined by 10 members of the OCOA who would act as fishing guides and mentors for the trip. One councillor attending with the kids told officers, “this was an experience of a lifetime for the kids and it would be a trip that they would remember forever”. Thanks to all the generous sponsors each child was presented with a care package upon arriving at the lodge. Each package consisted of a fishing rod and reel, tackle box loaded with tackle, sleeping bag, t-shirt, rain gear and an assortment of other outdoor gear they would require for the trip. Everything presented to the kids was theirs to take home at the end of the event. In addition to learning how to fish the group was also introduced to a variety of other new experiences, including: an introduction to what Conservation Officers do on a daily basis, survival skills taught by an Ministry of Natural Resources (MNR) Conservation Officer, canoe training provided by an MNR Park Warden, a demonstration from a Conservation Officer and his canine partner and a visit from the MNR Fire Ranger Crew which included a demonstration of the different types of equipment utilized to control forest fires and even a visit from Smokey the Bear. Ontario Public Service Employees Union: Locals: 635 North Bay, 319 Parry Sound, 313 Barrie, 455 Belleville, 362 Peterborough, 434 Kemptville, 447 Pembroke, 224 Owen Sound, Horwood Lake Lodge, Jane and Finch Boys and Girls Club, Ontario Ministry of Natural Resources (Enforcement Branch and Fire program), Bass Pro Shops, Ontario Out of Doors Magazine, Ontario Federation of Anglers and Hunters, Greyhound Canada, Dave and Melissa Ferris, Ducks Unlimited Canada, WalMart, District 12, Mark’s Work Wearhouse, Big Mike’s Tackle Emporium, McDonald’s Restaurant, Orillia Fish and Game Conservation Club, Pickering Rod and Gun Club, Resources Integrated Ltd., Merrilu Brown, Donna Covey (Ottawa), SAIL (Vaughan), Albert’s Sports and Workwear (Timmins), Dumoulin Fishing Tackle (Timmins), 101 Enterprises (Porcupine), Pro Tackle Co. (Schumacher), Big Bear Camp (Timmins), White Birch Outpost (Timmins), Dr. Fuzy (Corbeil). For a complete history of this event, please visit the Events area at www.ocoa.ca.